Enchiladas can be pretty easy to make, with an exponentially greater payoff than the work put into them. Take my creamy enchiladas recipe, for example. Simple ingredients, half an hour, and one bowl. Done. However, some recipes are a bit more labor intensive, with an extra pot or homemade sauce involved. Still fine, because my love for enchiladas is so great I would dirty every dish in my kitchen to make a pan. When I’m sick going on five days, though, and I want to test a new enchilada recipe, the last thing on my priority list is stuffing, rolling, and saucing 12 flawless enchiladas. I got to thinking that really is the most annoying part. You use an extra pan or two to warm or fry the tortillas, dirty an unwieldy baking dish, and are usually left with extra enchilada filling taking up space in the refrigerator. Given the downsides, I know I’m not the only one looking for an occasional enchilada shortcut. The answer, as you can tell from the pictures, is enchilada pie! Because who doesn’t love a cheesy pie? I know for a fact that you guys do, because my spaghetti squash pie, cheddar sweet corn pie, and pie-shaped cabbage gratin happen to be among the most popular recipes on NCK. 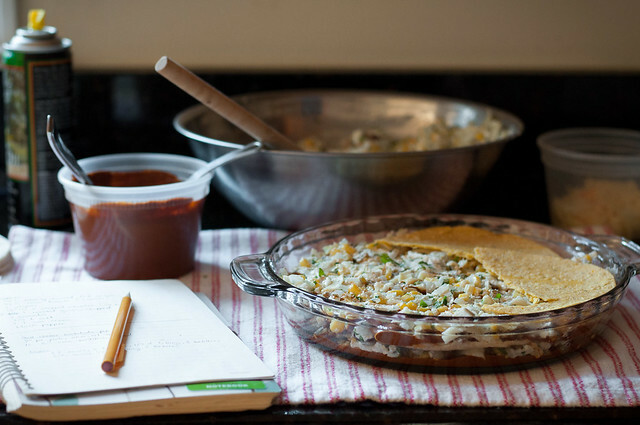 I discovered the formula to turn any enchilada recipe into an enchilada pie! I snapped many pictures of it (the ones you see in this post). Even though it’s part of my gratin series, and my plan has been sharing those recipes on the first try, no matter the results, I’m going to have to test this one again. It wasn’t bad. Definitely not one to discard completely, but alllll that goat cheese plus a heavy mole sauce was a little aggressive. It’s edible, and the concept is fantastic, so I really want to perfect it before I share the details. That way, it can taste as good as the pictures look. So, today, instead of the usual recipe, we have this awesome lesson in bringing Tex Mex a little further north into hot dish and casserole country. Worlds colliding. Before diving into the “recipe”, there are a few things you should note. 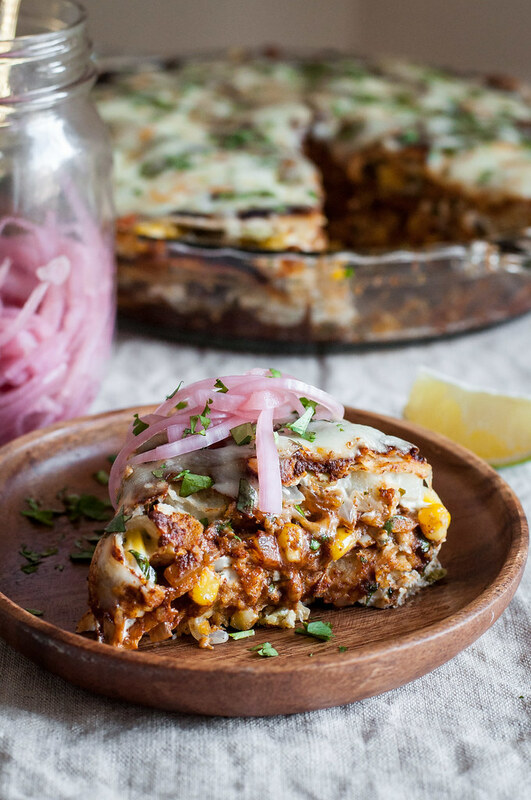 You’ll need an enchilada recipe. Meatless, meatful, I don’t care, just grab your favorite. Don’t have one? 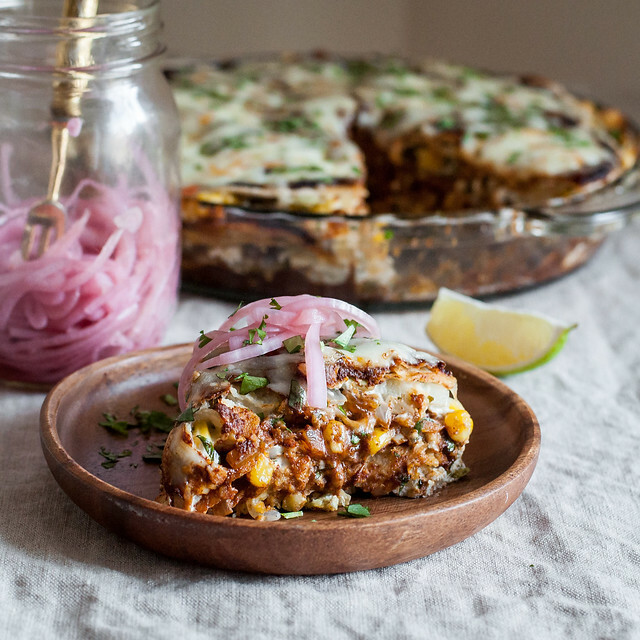 Try my creamy enchiladas, which would be perfect for this pie. The recipe is written with chicken, but I’ve substituted veggies many times with great success, and there’s a note about how to make the substitution. A recipe with a bit of cheese in the filling works really well, holding the layers together, but it’s not essential. If you’re using a strictly meat or veggie filling, you can sprinkle some extra cheese on top of each layer of filling. Your pie plate. Even with my growing collection of savory pie recipes, I still turn to my trusty glass Pyrex pie plate. It’s 9″ and available on Amazon. 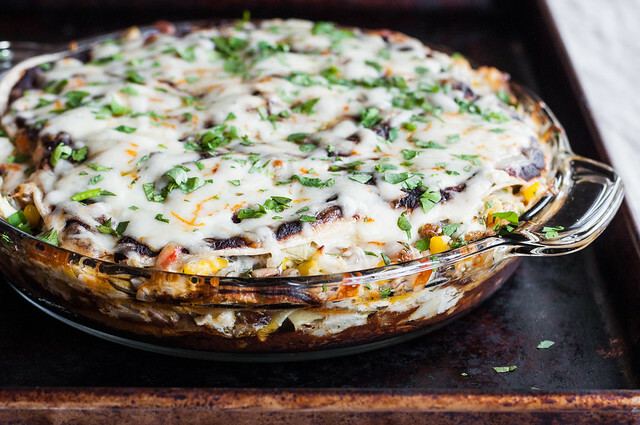 This enchilada pie formula will work even with slightly different size dishes, so feel free to use your 10″ oven-safe cast iron or nonstick skillet, a 9″ round cake pan, or a 9 or 10″ springform pan. Make it ahead: To streamline the process, make (and even freeze) your enchilada filling in advance. You can also assemble the entire pie up to 24 hours before baking (any longer and the tortillas tend to get too soft). Baking times. Cooking enchiladas isn’t like baking a cake. Your ingredients are all presumably pre-cooked, so the purpose is to make sure everything is hot and that the cheese on top is melted. Cooking also helps the enchilada sauce or salsa absorb into the tortillas, making them soft and tender. So, you don’t have to hit a certain baking time or temperature. If you made the pie ahead of time and it’s cold, you may need to bake it longer so it warms through, and if the filling is already piping hot, you might see that pie start to bubble in only 15 minutes. Don’t mess with the oven temp of 375 (it’s perfect for warming everything without burning the top), but keep an eye on the enchiladas and don’t be afraid to take them out early or leave them in longer. Be creative. Once you have the hang of it (or if you feel confident in the kitchen), play with the layers, especially sauce and cheese. You can go crazy, adding tons of cheese, or throw in some extras like olives, tomatoes, beans, or scallions. Disclaimer: it is really difficult to screw up this recipe, even if you forget what layer you’re on and change up the order. 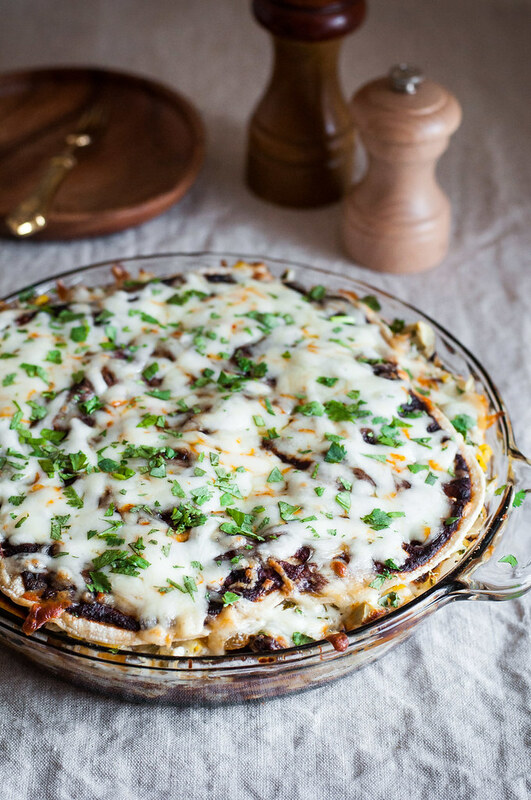 Make your favorite enchiladas recipe a little bit easier to make and a whole lot more fun to eat, by turning it into enchilada pie. Preheat oven to 375 (F). Spray or lightly oil a standard 9" pie plate. Cut or tear the tortillas in half. Spread 3 tablespoons sauce in the bottom of the dish and cover it with a layer of 6 tortilla halves. Spread a third of the filling gently and evenly over the tortillas. Cover with another 6 tortilla halves, pressing down on the tortillas to pack the filling down. Spread 3 tablespoons sauce over the tortillas. Repeat the same layers 2 more times: filling, tortillas, sauce. Generously sprinkle the grated cheese over the last layer of sauce. Bake on a rimmed baking sheet (in case of overflow!) on middle oven rack for 20 to 30 minutes, until bubbly and cheese is melted. Let cool briefly before slicing and serving. Prep time does not include preparation of enchilada filling. Note: This page contains affiliate links. It does NOT contain sponsored content. 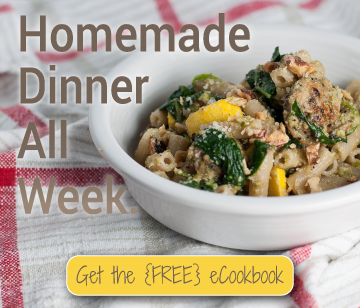 Affiliate links (to products I recommend, on Amazon) offset my ingredient and website maintenance costs, so I can keep bringing you time saving recipes like this one. Thanks! Great idea and very well explained! The creamy chicken enchilada sounds delicious.